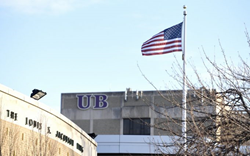 The University of Bridgeport (UB) announced today a new financial aid program that slashes tuition by 50 percent for members of the U.S. military and law-enforcement agencies who are enrolled in its Master of Arts (M.A.) in Criminal Justice and Human Security program. UB's Commitment to Service tuition-assistance program takes effect immediately and is open to part- and full-time students. Veterans and active members of all branches of the military, parole officers, and law enforcement personnel who live in Connecticut, New York, or New Jersey are eligible. The new 50-percent tuition cut is “an extension of UB’s comprehensive financial aid programs,” said Executive Vice President for Enrollment Management Karissa Peckham. As a Yellow Ribbon School, for instance, UB awards eligible veterans merit- and need-based financial aid above and beyond educational benefits offered under the Post-9/11 G.I. Bill. Ninety-seven percent of all UB students receive some form of financial aid through grants, scholarships, work-study, and loans. To learn more about financial aid for the military and law enforcement personnel at the University of Bridgeport, visit the Veteran Student Guide or call 203-576-4552. UB’s master’s degree in Criminal Justice and Human Security builds students’ expertise in international political, cultural, and socioeconomic conditions that contribute to both the rise and reduction of crime around the globe. The program equips students with insight into the cultural, ethnic, religious, and ideological differences often discovered at the root of criminal acts, violence, and terror. In-depth topics covered in this program include but are not limited to: domestic, international, and comparative criminal law; transnational crime; cybercrime and cyberterrorism. For more information, please visit the program’s web page.